Sometimes it happens discretely, unnoticed until an 0-for-16 stretch provides us with a casual small sample size to overreact to. Other times it’s sudden, buoyed by an other-worldly week of at bats that make the following week’s productivity seem relatively worse than it actually is. Then there is Aaron Judge’s May. After one of the best one month stretches in MLB history, we knew nothing could be done to extend the 60 HR pace, or record shattering .447 isolated power number, but here at BP Bronx, we’ve had multiple great writers cover the positive signs that made New York optimistic this wasn’t a complete flash in the pan (most notably, Martin Nolan and myself). Judge developed into not only a patient hitter, but a hitter who basically broke Statcast when he decided to leverage the limbs extending from his 6’7″ frame to warp a five ounce ball into the shape of his choosing. Our May sample of how pitchers have approached Judge is our first look at what has changed. What I did was simply charted the difference from BrooksBaseball.net of Judge’s April and May (up to May 18th’s games) and examined the differences. If there was a part of the zone that Judge was seeing more pitches in month-to-month, it’s colored green with a positive percentage, implying an increase. Zones colored red show a decrease in percentage month-to-month. The biggest takeaway is that pitchers adjust beautifully to where they have even the slightest inclination a hitter may be weak. Even in Judge’s monster April, he had an issue with pitches down-and-in, particularly ones outside of the strike zone. Our bottom left square shown above in green (0.67%) is where Judge swung and missed the most in April among any other part of his zone profile where he saw 10+ pitches in the month (28% whiff rate). So what have pitchers done in May? They’ve attacked that part of the zone. 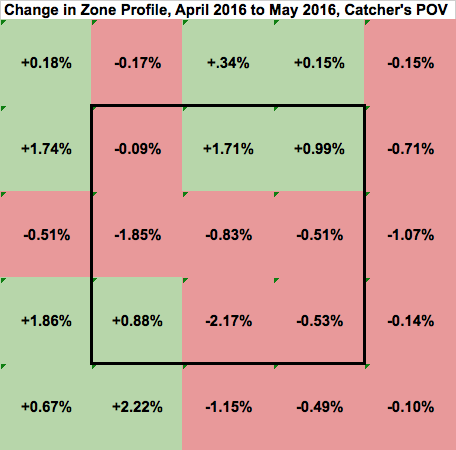 Still referencing our change in zone profile picture above, the bottom left grouping of four squares, all colored green, amass some of the largest increases in where we’ve seen pitchers throwing to Judge in May (+2.22%, +1.86%, +0.88%, +0.67% squares above). The other quadrant where we notice an increase in targeting sits in the upper part of the zone, another minor hole that April allowed us to see was an issue (+1.71%, +0.99% squares above). This will be particularly hard to do as it’s a common belief hitters with such large frames like to get extended and drive the ball, as we’ve seen on any number of Judge’s bombs. Fiers’ pitch in that linked video was out over the plate, but imagine how much more difficult it would be to generate the same extension and power if that pitch was inside, and closer to his knee. A simple fix would be to lay off those pitches, but as we’ve seen with any above-average, high variance power hitter, that’s easier said than done. Simply telling a player like Judge, Joey Gallo, or Keon Broxton not to swing at certain pitches may not be the best way to go about improvement. As we’ve seen with Judge, it’s more about one’s approach as a whole, pitch recognition, and various other factors that go into not swinging. From April to May so far, here is what Judge is pulling the trigger on. Even with the surprising fact that pitchers have chosen to challenge Judge with fastballs more in the month of May than April (54% to 57% fastballs seen), Judge has actually swung at more offspeed pitches this month. Perplexing to some extent, sure, but the big point to make is that he’s swinging at more pitches both inside and outside of the zone for the month of May (In zone swing % is up 5%, outside of zone swing % is up 4%). It seems to me like an effort to both recognize and react to offspeed pitches across the spectrum. While it hasn’t produced incredible results so far, I like the ability for him to react back to pitchers when they react to him. 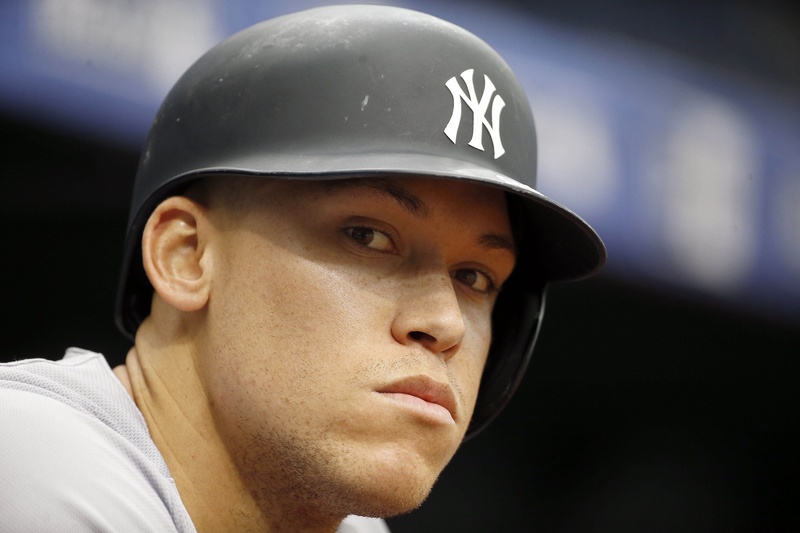 It’s a battle of changes for Judge at the moment, and when a 25 year old can change with nothing blatantly egregious as a result, I’m encouraged for the next few months of the Yankees’ new stud. In the month of April, Judge’s OBP was .411, through May 18th, he was riding a .452 OBP. Walking more in May has been glossed over since Judge’s strikeout rate ticked back up to the 30% mark for this 18 day stretch. More encouraging is that he’s only swinging and missing at about .3% more pitches in May than he was in April. As long as in the aggregate, Judge can stay in the 25-30% strikeout window with his walk rate as high as it is (14.5% in May), success and extremely valuable at bats can be had. I’ll leave you with the player we initially thought was a bad comp for Judge, Giancarlo Stanton, and the tale that it took him 800+ games to get below a 25% strikeout rate.